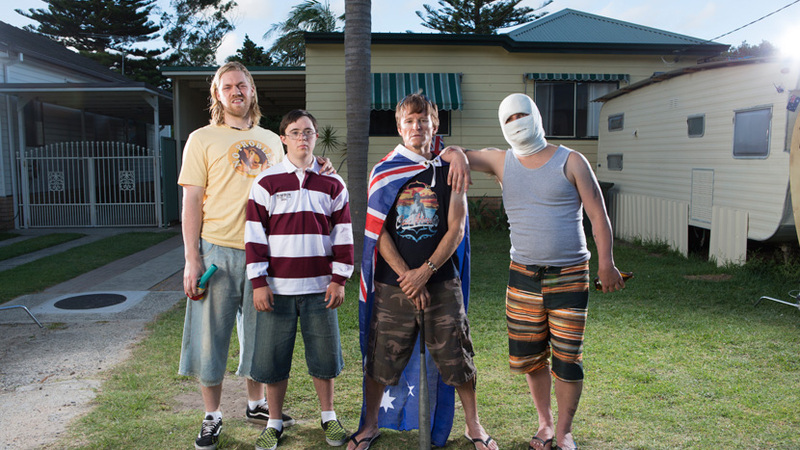 DOWN UNDER is a sometimes predictable, often very funny and continually highly disturbing film tackling heightened racial tensions between a self-described native population against immigrants. In this case, rather than contemporary America or Europe we're in Australia in the mid 2000s. Apparently, back in 2006 a bunch of Aussie racists set upon a bunch of Lebanese immigrants on Christmas day, prompting the inevitable backlash from the targeted community. Writer-director Abe Forsythe opens his film with shocking documentary footage of the riots - shocking at least to those who, like me, had no idea they had occurred. At this point, I wasn't sure if I was sitting down for a hard-hitting political documentary. But the mood quickly shifts into dark comedy, and a satire on both sides of the racial fracas. The irony is that, to the viewer, the warring factions have a lot in common: ignorance, racial and sexual prejudice, and ineptitude. Moreover, each side has four men of differing but symmetric profile - the gung-ho violent leader; the nice guy who turns nasty; the quirky comic relief guy; and the true societal outsider who turns out to be the wisest of the lot. (In the case of the white Aussies, that's the down syndrome cousin, and in the case of the Lebanese immigrants, it's their visiting uncle - the only practicing Muslim in the group.) Along the way, the movie also pokes fun at the Aussie obsession with Gallipoli and Ned Kelly, bogan bad parenting, the idea that the white Aussies crave Turkish food, and the fact that the second generation immigrants are so assimilated as to be as feckless as the white population. The resulting film is pretty predictable but really very funny and rightly disturbing. Even though you know where it's going, I was still tense wondering exactly how the director would get there. The film also looks good, with a really imaginative use of framing and panning to reveal a character we didn't realise was part of the scene, not to mention some of the best incidental pop music since the car-ride scenes in Wayne's World. It's just the right mix of stupidly funny and politically provocative, and if some of the social commentary is a little too on the nose, the timing of its release couldn't be better. DOWN UNDER played the Sydney and Melbourne film festivals earlier this year. There are tickets left for all three screenings at the BFI London Film Festival 2016. It does not yet have a commercial release date. The movie has a running time of 90 minutes.